The best way to understand a judge is through his judgments. A glance at the many landmark judgments Altamas Kabir, the new Chief Justice of India, has delivered or been part of in his career reveals two striking traits - a commitment to upholding constitutional propriety and an enormous empathy for the disadvantaged sections of society. Kabir, 64, has been on benches that delivered judgments on many constitutional matters, human rights cases and election issues. These include restraining banks which used musclemen for loan recoveries, ruling that female relatives of a husband could also be booked under the Domestic Violence Act, upholding of the constitutional office of Governor, and laying down that a member of Parliament removed or suspended by his party does not lose Parliament membership. In 2008, strongly defending the fourth estate, he restrained the Gujarat government from arresting political analyst Ashish Nandy for a piece Nandy had written. Justice Kabir told the Gujarat counsel at the time: "If a journalist cannot write, then who else will?" Kabir began his career in 1973 as an advocate in a West Bengal district court and later, the Calcutta High Court. He became a permanent judge of the Calcutta High Court in 1990. He was made chief justice of the Jharkhand High Court in March 2005 and elevated to the Supreme Court in September that year. Kabir hails from a family of educationists and politicians from West Bengal. His uncle Humayun Kabir was education minister under prime ministers Jawaharlal Nehru and Lal Bahadur Shastri. His father, Jehangir Kabir, was a trade union leader who also served as a minister in West Bengal. His sister Shukla Kabir Sinha is a judge in the Calcutta High Court while wife Minna Kabir is a child rights activist. Lawyers who have appeared before Kabir say he gives them all a patient hearing, and has no pre-conceived notions. "Whether you win or lose a case, you come out satisfied that you got the fullest hearing from him. That's all a lawyer wants," says senior Supreme Court advocate K.T.S. Tulsi. "He has no hang-ups." U. Sarathchandran, member-secretary of the National Legal Services Authority, concurs. "He's very amicable and accessible to even the lowest cadre," says Sarathchandran. "He's very strict at the same time. No one can influence him based on any acquaintance." Kabir takes charge at a time when the Supreme Court is increasingly deciding on matters that vitally affect Indian business. Its opinion on how the government should allocate natural resources - following a Presidential reference - is the latest instance. It may soon take up the alleged irregularities in allocation of coal blocks as well as a public interest litigation on foreign direct investment in retail. But Kabir's legacy will also depend upon how he tackles the challenges facing the judicial system, such as the huge number of pending cases, the vacancies in high courts, and the perception that the judiciary is encroaching into the domain of policymaking. He retires on July 18, 2013. Joseph "joe" Hinrichs, 45, President, Asia Pacific and Africa at Ford Motor Company, loves to "borrow" - as he puts it - his son's black Mustang and go on long drives. He loves zipping along the expressways near the company's headquarters in Detroit. "It relaxes me and helps me think," he says. Despite his punishing schedule, he also works out for an hour every day. Hinrichs, who was in India recently to oversee the progress of Ford's new plant, being built in Sanand, Gujarat, says the country is very important for his company and will be the third-largest car market in the world by 2020. Naturally, Ford wants a large share of the market and is investing around $2 billion here over the next few years. It also plans to make India its global manufacturing platform for small cars, and will introduce five new cars here by 2015. Hinrichs is tipped by many insiders to eventually take over the top job at Ford. Though born and brought up in the Scottish Highlands, David Blackmore never cared for single malts while young. But that was a long time ago. Today, the 37-year-old Scotsman is Master Brand Ambassador of one of the oldest and best known single malt makers, The Glenmorangie Co. Ltd, founded in 1843. He became its ambassador to the US in 2005, his domain expanding to include Asia and Canada in 2010. Blackmore was recently in India to unveil Glenmorangie's 'Unnecessarily Well Made' initiative through a creative collaboration with automotive design stalwart, Dilip Chhabria. "Single malt is an acquired taste, which is well worth putting in an effort into acquiring while growing up," he says. 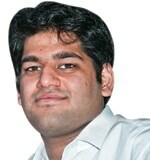 Sudarshan Venu, VP, TVS Motor Co.
His baptism has been by fire. When Sudarshan Venu, 23, joined TVS Motor Co. - of which his father Venu Srinivasan is Chairman and Managing Director - last December as Vice President, he was immediately plunged into the development of a product the company is banking on to bring it back in the reckoning. TVS has been losing market share in two-wheelers. The TVS Phoenix 125, which Venu rode at its recent launch, also ends the company's absence in the profitable and high volume 'executive bike' segment. Company officials claim the new offering benefited from Venu's involvement, given his multi-disciplinary educational background straddling economics, engineering and technology development. Anuj Khanna Sohum, Founder and Chairman of Affle Group, started and sold his first company when he was 20, and still a student at the National University of Singapore. Now 34, he calls himself a 'serial entrepreneur'. Started in 2006, Affle - short for Affordable and Mobile - is the first Indian company to focus solely on advertising on mobile phones, offering digital solutions using SMS Internet feeds. "India has huge potential as a mobile marketing destination because of the insatiable consumer appetite for mobile content," he says. He also recently launched Ripple, which he calls "the next generation media and video advertising network platform for all smart devices". An avid swimmer, Sohum also loves singing, especially to his infant son. When the boy grows up, will he switch to sending him SMSes instead? The Tata Group has been infusing young blood in senior positions at a steady trot. Avani Saglani Davda is the latest among them. The 33-year-old Tata Administrative Service product has been made CEO of Tata Starbucks, the 50:50 joint venture of Tata Global Beverages with US-based Starbucks Coffee Co., to bring the Starbucks brand to India. Davda, a management graduate from Mumbai University, who has been with the group for a decade, will oversee the JV's plan to invest $80 million initially. Tata Starbucks opens its first coffee shop in south Mumbai later this month.